I love bees!! They are my favorite insects. I’m guessing most people do not share my affection for these amazing creatures—I know Kimiko doesn’t. But I think they are intriguing. Not only are they beautiful, but they pollinate our crops and provide us with honey. Someday I would like to have a hive in our backyard. I’m not sure exactly where I got my fondness for bees, but it’s possible that it came from visiting my mom’s Uncle Stu when I was a kid. He has been a beekeeper in Pennsylvania for 46 years. He sells his honey under the name Honey Crest Farms. I remember looking at his hives as a little girl. A few summers ago, Robbie, Keanna, and I took a trip to Pennsylvania to visit my grandparents. While there, we had the opportunity to spend an afternoon with Uncle Stu and his bees. He even let us cut open some honeycomb!! Honey itself is an amazing food. Its color and flavor vary drastically depending on the nectar from which it is made. Probably one of its most impressive qualities is that you can store it a very long time. As long as it is stored in a sealed container, it will keep indefinitely. Bacteria cannot thrive in honey, therefore it will never go bad. The one problem with storing honey for a long time is crystallization. Over time, the sugars will crystallize, forming a solid mass. This is easily reversed with a little heat. About four years ago, Robbie’s mom gave me a one-gallon(!) tub of honey from her relatives in Montana. That’s a lot of honey!! I am still using it. It crystallized a long time ago. I simply scoop some of the honey into a jar and pop it in the microwave to liquefy it. We usually use the honey in the jar before it re-crystallizes; but if not, I just stick it back in the microwave. If you have crystallized honey in a plastic container, you can use a hot water bath to liquefy it. Don't throw away crystallized honey!! ...to this. Just watch it carefully as it can and will boil over. Also, use extreme caution--it will get hot! One of my favorite things to make with honey is honey milk balls. I got this recipe from Uncle Stu’s daughter, Jill. She was the Pennsylvania Honey Queen in 1988, and is now the VP of Sales and Marketing for Dutch Gold Honey. Her original recipe calls for coating them in 6 blocks of unsweetened chocolate melted with 1 Tbsp. butter, ½ block of wax, and 1 tsp. vanilla. I really like dark chocolate, so I tweaked that part of the recipe. Combine honey and peanut butter. In a separate bowl, combine dry milk and oats. Work dry ingredients into gooey ingredients. Refrigerate until cool. Meanwhile, place chocolate and shortening in microwave-safe bowl. Microwave 45 seconds; stir. Continue to microwave in 30-second intervals, stirring thoroughly between heating times until smooth. Line a rimmed baking sheet with wax or parchment paper. Roll cooled mixture into small balls. Dip cool honey balls into chocolate and place on baking sheet to harden. If mixture gets tacky, stick it back into the refrigerator to cool before continuing. Likewise, as chocolate cools, return it to the microwave for 10-15 seconds to warm up. Candy-dipping tools are great if you make a lot of candy. Otherwise, a fork will do the job just fine. Toss a few in and turn to coat. Let excess chocolate drip back into bowl. chocolate drip off. Maybe that's a good thing? For more information, tips, and recipes using honey, see the American Honey Board website. If you are interested in beekeeping, see the American Beekeeping Federation. *Note: You may have noticed that I used Alton Brown’s plunger measuring cup for the peanut butter and honey. 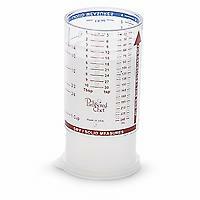 This is similar to the Pampered Chef mini measure-all cup we’re giving away tomorrow!! If you haven’t already entered the giveaway, you can find all the details here. I'm not sure how muffins became a commonly accepted breakfast food. It's basically a cupcake without frosting. Yes, I know there are other differences between cupcakes and muffins; but nutritionally, I don't think there's much difference between the two (other than the frosting, of course). Anyhow, I rarely ever make muffins because I really don't need the temptation of having them in the house. They do make for a quick and easy breakfast, which means I'll probably be more likely to grab a muffin if it's there, rather than have a healthy breakfast. Anyway, something got into me last week and I decided to make a batch of muffins. They actually ended up coming in quite handy, as we had some early doctor appointments this week and were up before the sun. We were able to grab a muffin and eat on the run. I had also come across a muffin recipe that was somewhat healthy...or at least healthier than most other muffin recipes I've seen. It called for carrots and zucchini, which I just happened to have extras of in my refrigerator, so I thought this would be a perfect way to use them up. 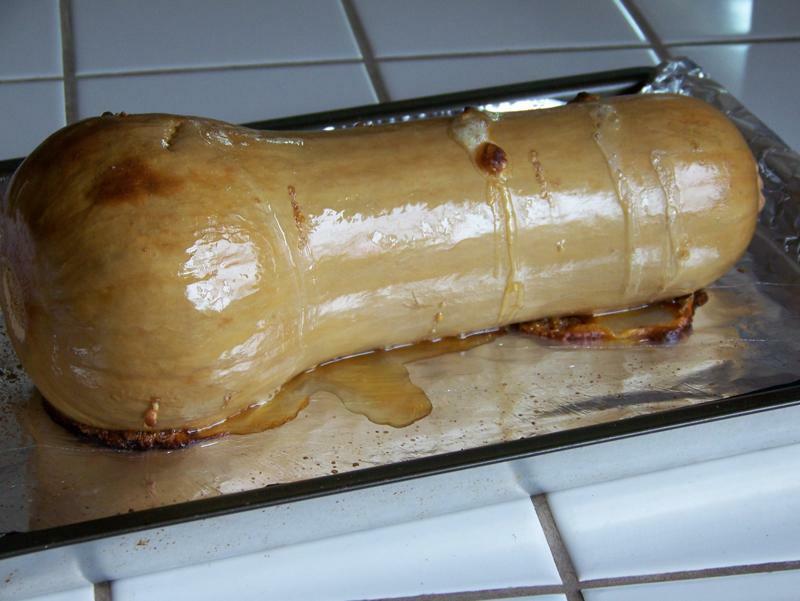 The author of the recipe on Allrecipes said she came up with this recipe to get her kids to eat vegetables. However, I can't suggest using this as a substitute for veggies. Your kids would have to eat a lot of muffins to get a whole serving of veggies, considering there's only 2 cups in the whole batch!!! As is my style, I didn't stick with the original recipe, but was thrilled with how my version came out. My hubby and daughter loved them too! Preheat oven to 400 degrees. Lightly grease 21* muffin cups. In a medium bowl, mix the all-purpose flour, whole wheat flour, oats, salt, baking soda, baking powder, cinnamon, and nutmeg until combined. Set aside. 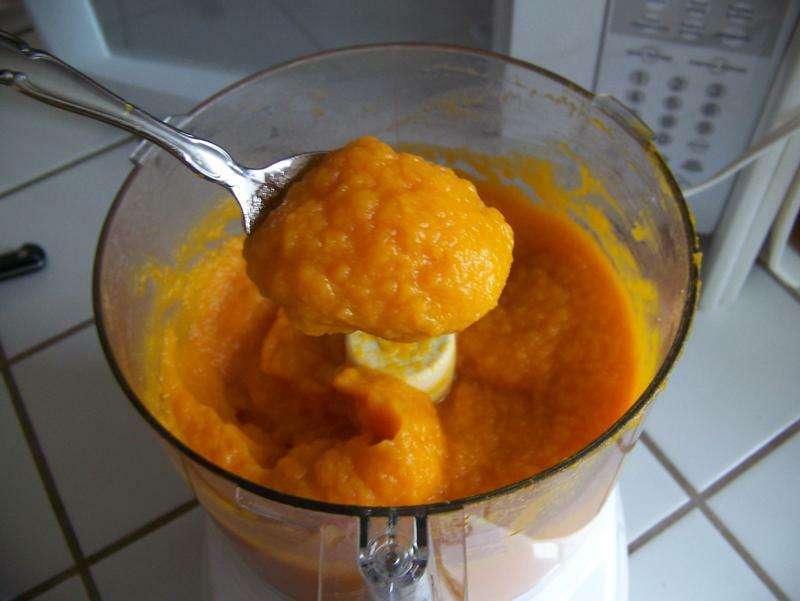 In a large bowl, combine eggs, vegetable oil, applesauce, yogurt, sugar, honey, and vanilla; mix well. Add the dry ingredients to the wet ingredients, mixing just until all ingredients are combined. In a paper towel or clean kitchen towel, squeeze most of the liquid out of the carrots and zucchini. They will clump together, so use your fingers to separate them a bit so as to not end up with clumps of veggies in your muffins. Fold carrots, zucchini, and any other desired ingredients (raisins, dried cranberries, nuts, etc.) into muffin batter. Fill muffin cups 3/4 full and bake for 18-20 minutes or until a toothpick inserted in center comes out clean. Cool 10 minutes; transfer to wire racks to cool completely. These are amazing when they're warm. You can place any leftovers in a zip-top bag and freeze them if you're not going to eat them within the next few days. I made half of these plain and half with dried cranberries and chopped pecans. *The original recipe said 24 muffin cups. I think I filled mine more than 3/4 of the way, so I only got 21 muffins. 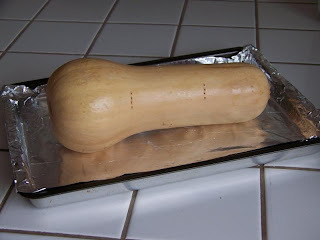 It was my desire to post about butternut squash and acorn squash, but it is 11:07 pm on Friday night and I just realized that tomorrow is Saturday and I don’t have it written yet. So I will just be discussing butternut squash and will save acorn for another time. To keep this post short and quick, I will include a lot more general squash info when I post about acorn squash. 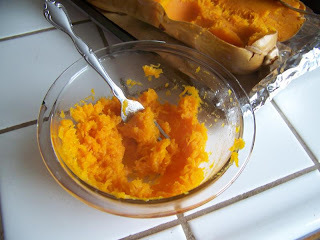 Winter squash is a great baby food because they tend to really like it. It’s sweeter than a lot of other vegetables. It’s also easy to make. 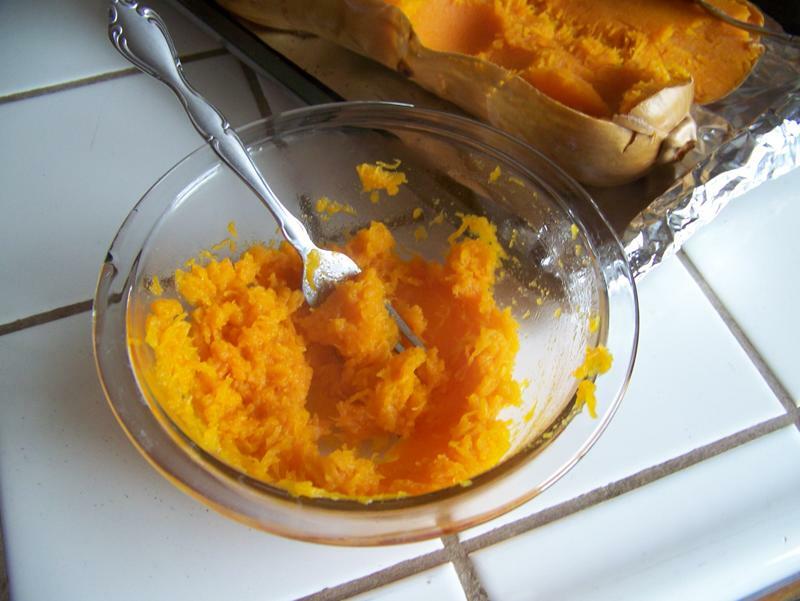 There are several ways to cook winter squash. I usually bake or microwave it whole. 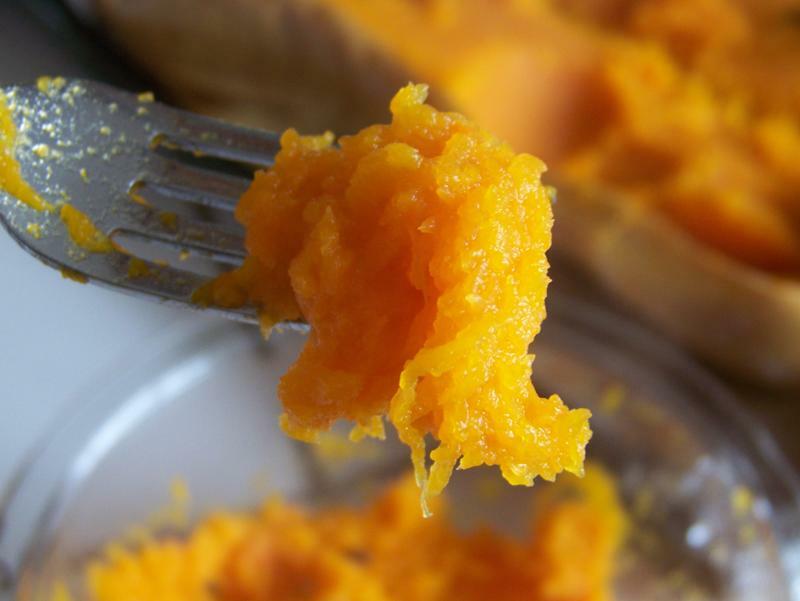 Just as with yams, you need to be careful about the amount of squash you feed your baby. Too much will make their skin turn orange. Preheat oven to 375°. Line rimmed baking sheet with foil. 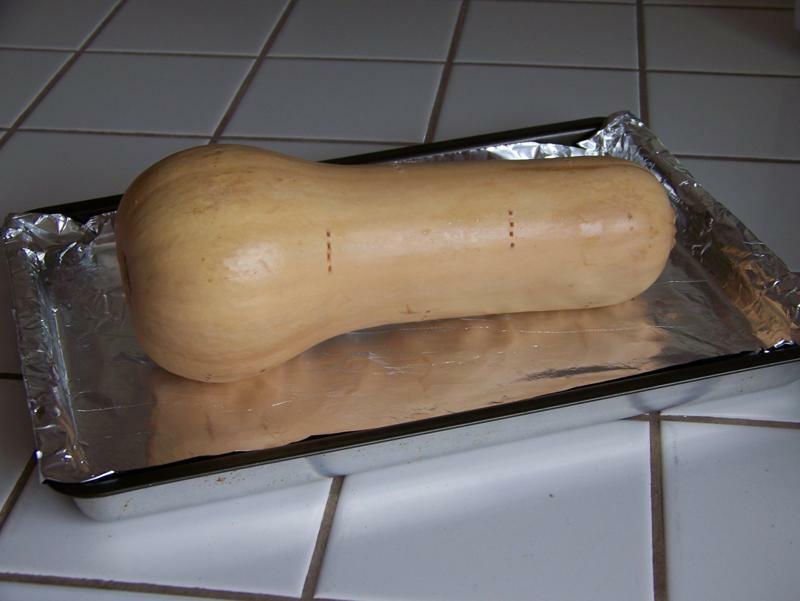 Pierce squash with fork and place on baking sheet. 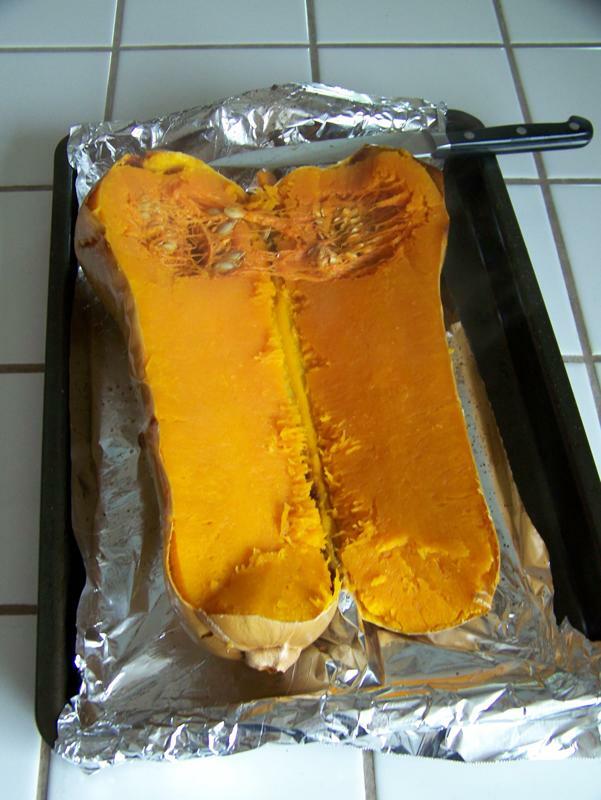 Bake until tender in middle when pierced with fork, about 45 minutes for a small squash and 1½ hours for a large butternut. will end up on your pan! Cool slightly. Split squash down middle. Scoop out and discard seeds. Scrape out flesh. Mash with fork or potato masher. For a smoother texture, purée in food processor. 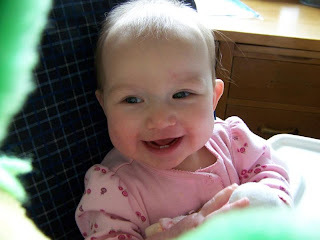 I don't have a photo of April enjoying her squash, but she really likes it! Here is a cute one of her looking at a puppet. In a few previous posts, I’ve mentioned a cookbook that someone gave me when I got married. This is where I got the recipes for Auntie Pearl’s sweet and sour chicken and Auntie Laurel’s comfort soup. I promised I’d sometime devote a post to the cookbook itself because it is such a treasure, so here it is. The cookbook was given to me by Barbara. She has known me since I was two years old, when I attended the preschool she had in her home. But her influence in my life did not end when I went off to kindergarten. She and my mom developed a friendship, and Kimiko and I became friends with her two youngest sons, who are our ages. Over the years, we’ve gone to school with her boys, carpooled together, spent holidays with her family, and now she and Robbie work at the same school. When I got engaged, she collected recipes, photos, and notes from friends and family members. She put them all together in a beautiful recipe book that I absolutely love. It would actually be more accurate to describe it as a scrapbook that happens to contain recipes. She put so much love and work into it—I can’t imagine how long it took her to put it together. She started it out with a page where I can put photos of my family (I still need to do this). Barbara asked each person to submit a recipe and a photograph. These are the recipes and photos submitted by our mom and Kimiko. She also gave everyone a card to write a note to me, and precisely cut through the page protectors so I can open and read them without having to take the pages out. In addition to the pages she designed and decorated, she included blank pages throughout so I can add my own recipes or collect more from other people. This blank page is across from our Grandma’s pot pie recipe. Here is a really cute page she did for her son Josh’s recipe (he’s a chef). He makes these barbeque-bacon chestnuts every Christmas—yum! All the recipes are organized into categories. She typed some of the recipes to make them fit better, but wanted me to have all the originals. The back cover of the book has an envelope that holds them. As you can see, this cookbook that Barbara made for me is truly special. It contains some of my favorite recipes and represents a lot of the people who have been influential in my life. I will always cherish this book.